Where Was Hydraulic Fracturing First Used? Halliburton was the first company to fracture a well hydraulically, at the Hugoton gas field in Kansas in 1949. 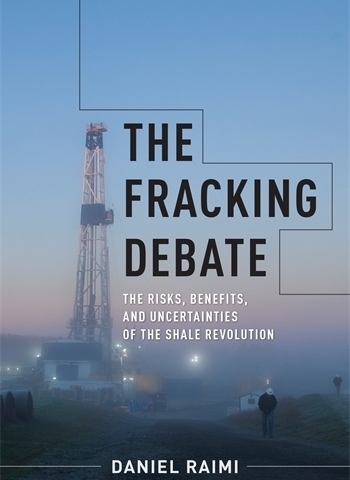 “The Fracking Debate” book cover. Image courtesy of Daniel Raimi. Oilfield-service firm Halliburton, contracted by Stanolind Oil, was the first to fracture a well hydraulically, pumping a mixture of napalm and gasoline into the Hugoton gas field in western Kansas in 1949. “Since that time, hydraulic fracturing has been applied to millions of wells around the United States and the world,” notes Daniel Raimi, senior research associate at Resources for the Future, in his book “The Fracking Debate: The Risks, Benefits, and Uncertainties of the Shale Revolution” (Columbia University Press). We asked Raimi—who teaches energy policy at the Gerald R. Ford School of Public Policy and is also a faculty affiliate with the University of Michigan Energy Institute—to give us a brief history of “well stimulation.” As we’ll see, the first company to profitably extract natural gas from shale was Mitchell Energy, which ushered in the shale revolution. Daniel Raimi said: Hydraulic fracturing is one specific type of well stimulation. Well stimulation is something that companies do after a well has been drilled, and it’s done in order to increase production. Since the 1860s—essentially the very beginning of the oil industry—companies have been stimulating oil and gas wells. For example, in the 1860s in northwestern Pennsylvania, where the industry essentially got going, there were people walking around with wheelbarrows full of nitroglycerine-based explosives. They would sell the explosives to oil and gas operators, who would lower them into wells and detonate them to increase the amount of oil produced. The basic technology has been refined over time and the thing that has enabled production to grow so rapidly in the last five to ten years is the application of hydraulic fracturing combined with a couple other technologies. First and foremost is horizontal drilling. Companies don’t just drill straight down, they drill down and then sideways to access a larger portion of the rock formation they are trying to produce from. Most of the older oil and gas wells produce oil and gas from a more permeable foundation. Think of a sponge and how easily water moves through a sponge. But a lot of oil and gas is locked in impermeable rock formations, which is to say oil and gas doesn’t move through them easily. Some of those rocks are called shale and some of them have other names, but the only way to get oil and gas out of those impermeable rocks is to stimulate them with hydraulic fracturing, then to drill into them horizontally to access a larger portion of the rock formation. By applying a combination of technologies, companies have been able to access large volumes of oil and gas that previously were not economically accessible. No one could make money by drilling into shale formations until they started applying the combination of these technologies, which were first applied successfully in the Barnett shale in the Dallas-Fort Worth area of Texas. The company that first did this successfully was Mitchell Energy. They drilled hundreds and hundreds of wells into the Barnett shale, continuing long after most companies would have given up. The founder of the company, George Mitchell, was somewhat stubborn and was convinced that Mitchell Energy could figure out a way to profitably produce natural gas from the Barnett shale. The company tried a number of different techniques and after ten or fifteen years of experimentation they finally figured out how to profitably extract natural gas from the shale in the late nineties. But it wasn’t until 2005 that you really started seeing other companies get onboard and apply these same technologies on a large scale, not just in the Barnett shale but also other natural gas formations such as the Haynesville in Louisiana and the Woodford in Oklahoma. After that the technology started to spread rapidly around the country, applied not just to natural gas formations but also oil bearing formations.